no one can get rid of. I was daunted by the prospect of writing an introduction to Legna’s work, as its calculated madness is almost impossible to delineate. The only way to experience Legna is to read her, and in doing so you’ll be left wondering if you accidentally slipped a nip of absinthe into your morning tea. As the publisher of her 2015 collection of short stories No sabe/no contesta (Don’t Know/Don’t Answer) put it, ‘Medical advice: Take a Carbamazepine – or any other anticonvulsant – before reading’. In other words, if the average maverick is dancing to the beat of their own drum, Legna’s dancing to the offbeat of a 30-piece jazz orchestra. It’s not that Legna’s use of structure or language are in any way new or unfamiliar, nor is she one of those nasty poets whose unfathomable verse will leave you feeling like you weren’t invited to the party; her appeal lies in the teasing banality of the words she uses. There is nothing lexically convoluted about the opening lines of her poem ‘Black Hands’: ‘A black man’s hands | are made for me’, yet there is no way its meaning can be digested on a first reading. 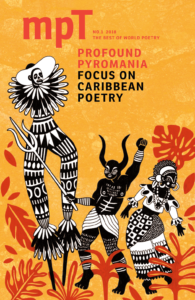 Throughout the poem Legna focuses on the black man’s hands as an independent phenomenon – do the hands belong to a black man, or have they been transposed onto her own body? Is the narrator the exploiter or the exploited, or can one ever really be separated from the other? Though the words she chooses are strikingly suggestive, even polemic, the poem’s meaning changes with every reading, forcing the reader to constantly question their dearlyheld preconceptions. Though worlds apart, when I read Legna I can’t help thinking of Keats, who referred to poetry as an experience beyond thought – ‘poetry soothes and emboldens the soul to accept mystery’. Much of Legna’s work is like an unsolvable cryptic crossword, yet the lightness and charisma with which she casts her lexical net leaves you caring little for the solution.